Where Did All These Zombies Come From? Zombie geeks love to argue about runners vs. shamblers, and whether zombies are defined by mindless behavior or strictly by flesh-eating, infectiousness, and undeath. The topic is nuanced enough that you could tell a new zombie story each day. The catch is that gamers expect a campaign to last a bit longer than that. 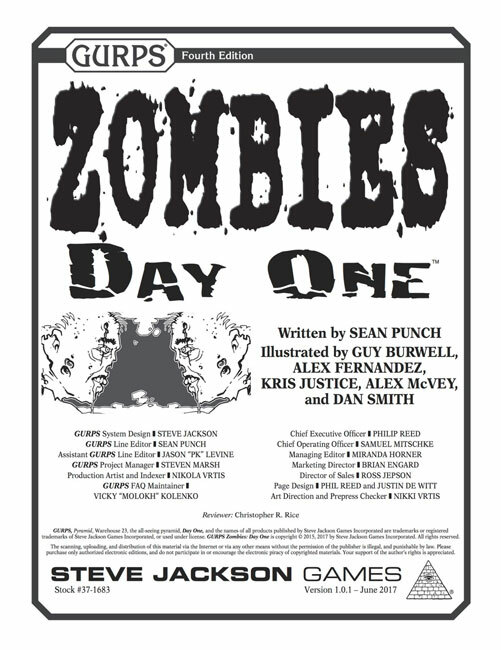 Which is where GURPS Zombies: Day One comes in. Empire of the Necromancer-King offers a fantasy realm overrun by cursed zombies. It certainly feels like an apocalypse, but the heroes must battle the hordes using swords and spells, not chainsaws and shotguns. Fields of Fear conceals dark doings in a town in the Antebellum South. You don't need a global onslaught of infectious ghouls to be very afraid. In fact, it isn't the zombies you need to worry about . . .
Savage Streets rips a page from today's news to bring you a city held hostage by drug-crazed, face-eating maniacs. Go ahead – tell them they're not real zombies! Zeta Force assumes that almost every kind of zombie exists and then casts the PCs in the role of "Men in Black" tasked with keeping the world safe without revealing the truth. Ultimate Zombie-Fighters jumps right into a video-game-style apocalypse in progress. Wrap your fists, grab your katana, load your shotgun, and get ready to rack up a body count! Alpha and Omega puts the heroes in the zombies' place . . . sort of. Would you want super-powers if the price were to become a hideous, hunted outcast living in humanity's dying days? Time of the Zombies starts where most zombie stories end: after society's destruction. Scrounge around in the ruins and rebuild, but be careful – worse things than zombies lurk out there. Depravity Well crashes brave space voyagers on a world that unleashed the wrong nanotech. Can a handful of brave women and men hold out against a whole planet of immortal flesh-eaters? No matter what kinds of zombies you prefer or how mighty you like your heroes to be, there's something here for everyone! 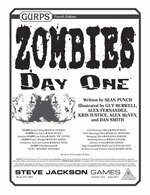 If you want to make the best use of the ideas from GURPS Zombies: Day One, you need GURPS Zombies! For more advice on running terrifying tales of all sorts, check out GURPS Horror.